The APH667 and the APH668 are GaAs-based broadband, three-stage amplifier devices that operate from 81 – 86GHz and 71 – 76GHz respectively. In 2004, Northrop Grumman became the first company to provide commercial availability of E-Band semiconductors. These new products are an example of Northrop's ongoing effort to push the boundaries of robust GaAs technology, said Frank Kropschot, general manager, Microelectronics Products and Services, Northrop Grumman Aerospace Systems. 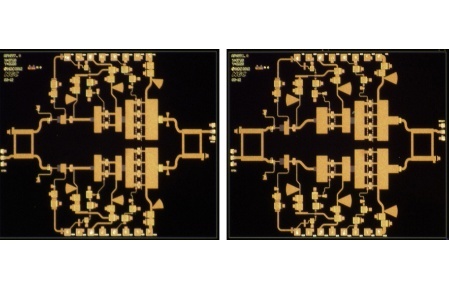 "Customers typically combine several MMIC products in this frequency band to achieve higher output power. The APH667 and APH668 will allow them to dramatically reduce the number of components required to reach those goals, simplifying the product's architecture and enhancing the performance," he said. The APH667 is a 0.1 mm GaAs HEMT MMIC power amplifier MMIC that operates between 81 and 86 GHz. This power amplifier provides 17 dB of linear gain, +25.5 dBm (0.35 W) of saturated output power (typical). 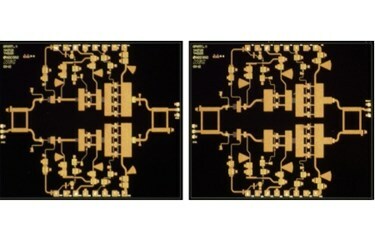 The APH668 is a 0.1 mm GaAs HEMT MMIC power amplifier chip that is operates between 71 and 76 GHz. This power amplifier provides 19 dB of linear gain, +28 dBm (0.63 W) of saturated output power (typical). Pre-production quantities of the APH667 and APH668 will be available in the third quarter of 2013 with production quantities available in fourth quarter of 2013. More information and advance data sheets on the E-Band product line are available online at www.as.northropgrumman.com/mps. Limited engineering prototype samples are available from stock to qualified customers by contacting Microelectronic Products and Services at as-mps.sales@ngc.com. Northrop Grumman is a pioneer in the design and fabrication of high-speed components for established and emerging commercial markets, including cellular and broadband wireless systems as well as aerospace, defense and scientific applications. The company also offers foundry services that utilize advanced gallium nitride, gallium arsenide and indium phosphide semiconductor manufacturing processes. Northrop Grumman is a leading global security company providing innovative systems, products and solutions in unmanned systems, cyber, C4ISR, and logistics and modernization to government and commercial customers worldwide. For more information, visit www.northropgrumman.com .